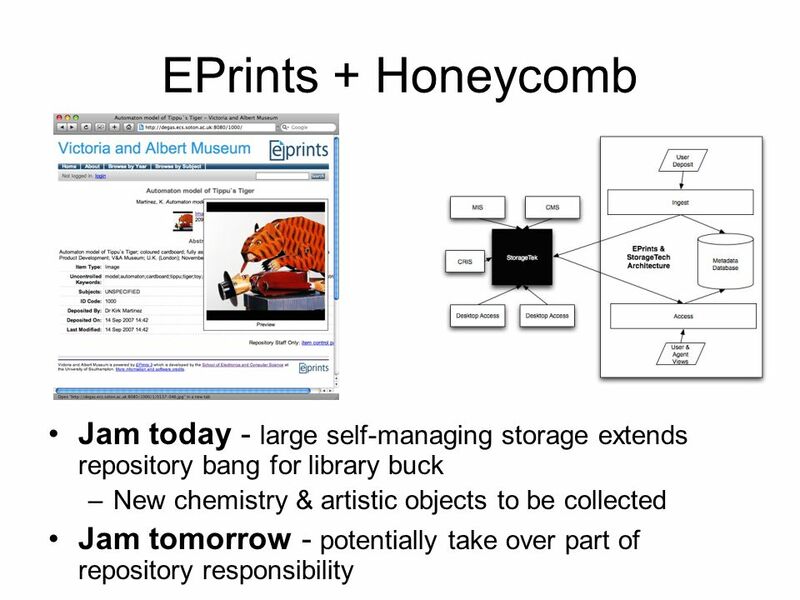 EPrints: Repositories for Grassroots Preservation Les Carr, www.eprints.org. 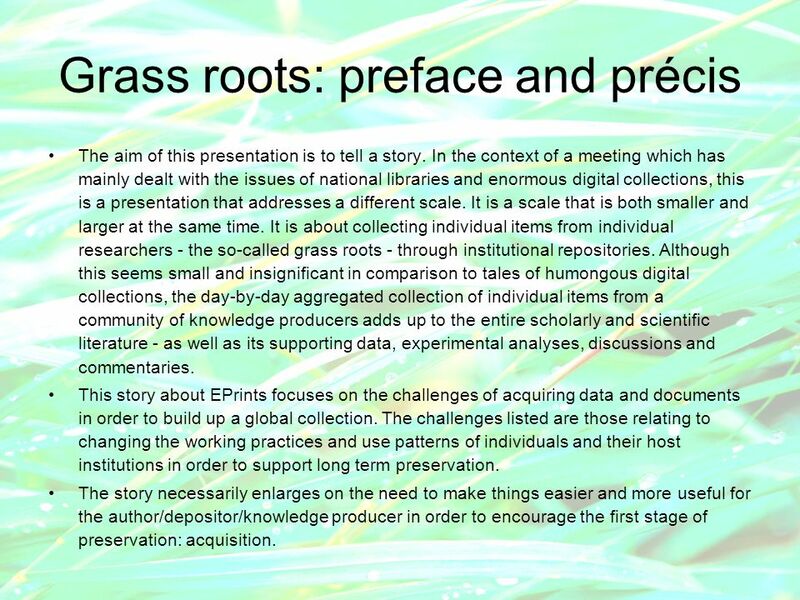 2 Grass roots: preface and précis The aim of this presentation is to tell a story. 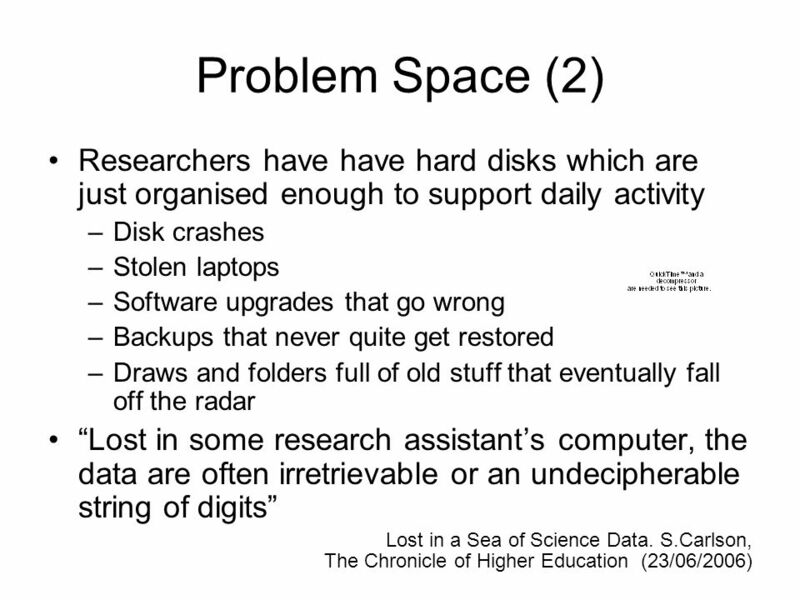 In the context of a meeting which has mainly dealt with the issues of national libraries and enormous digital collections, this is a presentation that addresses a different scale. It is a scale that is both smaller and larger at the same time. 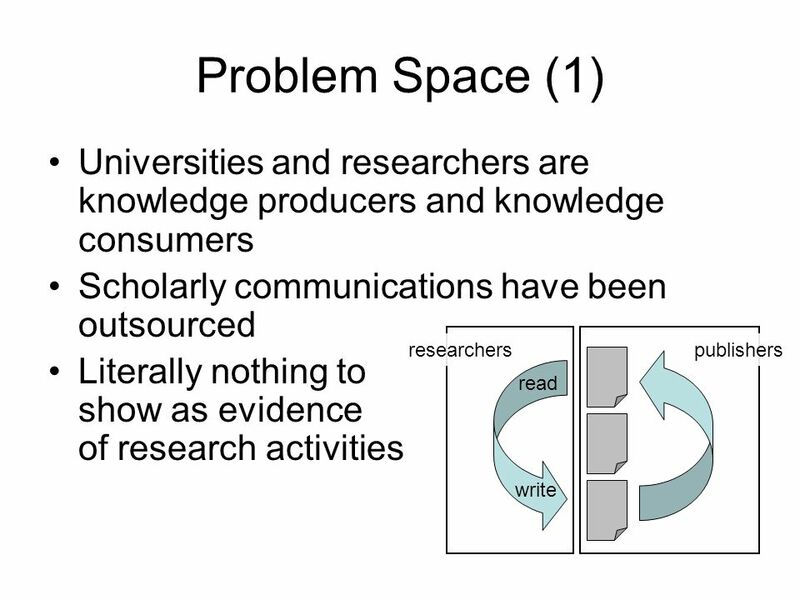 It is about collecting individual items from individual researchers - the so-called grass roots - through institutional repositories. Although this seems small and insignificant in comparison to tales of humongous digital collections, the day-by-day aggregated collection of individual items from a community of knowledge producers adds up to the entire scholarly and scientific literature - as well as its supporting data, experimental analyses, discussions and commentaries. 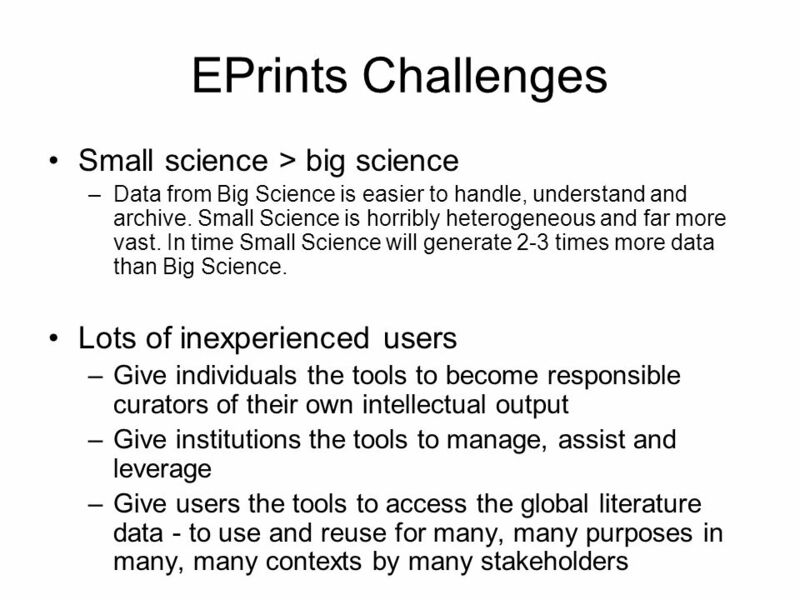 This story about EPrints focuses on the challenges of acquiring data and documents in order to build up a global collection. The challenges listed are those relating to changing the working practices and use patterns of individuals and their host institutions in order to support long term preservation. The story necessarily enlarges on the need to make things easier and more useful for the author/depositor/knowledge producer in order to encourage the first stage of preservation: acquisition. 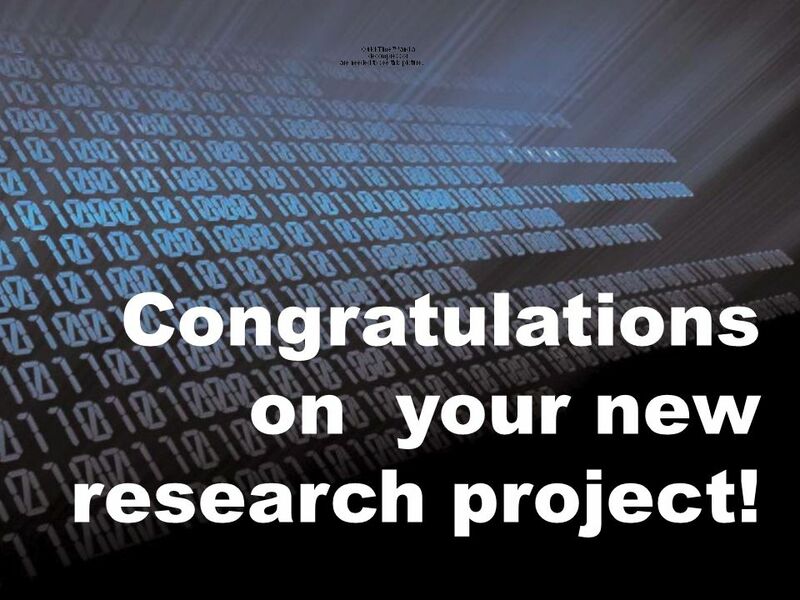 5 Congratulations on your new research project! 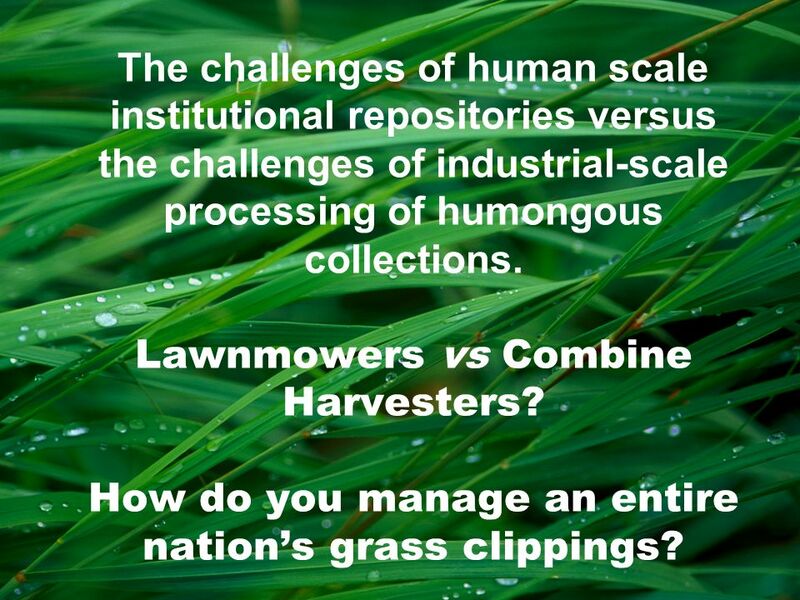 18 The challenges of human scale institutional repositories versus the challenges of industrial-scale processing of humongous collections. Lawnmowers vs Combine Harvesters? How do you manage an entire nations grass clippings? 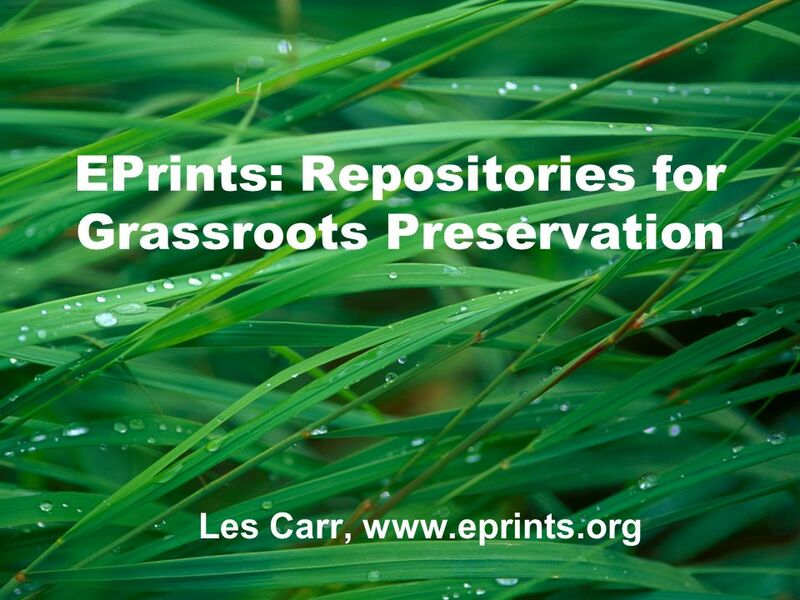 Download ppt "EPrints: Repositories for Grassroots Preservation Les Carr, www.eprints.org." EPrints - Introducing EPrints 3 Software William J Nixon Digital Library Development Manager, University of Glasgow With many thanks to Les Carr and the. Search, access and impact: Web citation services Tim Brody Intelligence, Agents, Multimedia Group University of Southampton. Preserv Preservation Eprint Services Simple Preservation Services – towards Proactive Support for the Institutional Repository. 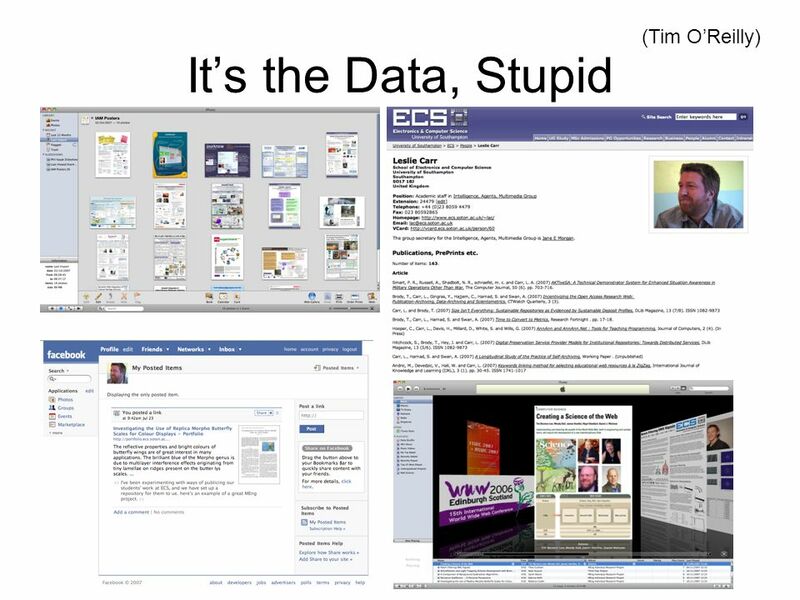 28 April 2004Second Nordic Conference on Scholarly Communication 1 Citation Analysis for the Free, Online Literature Tim Brody Intelligence, Agents, Multimedia. 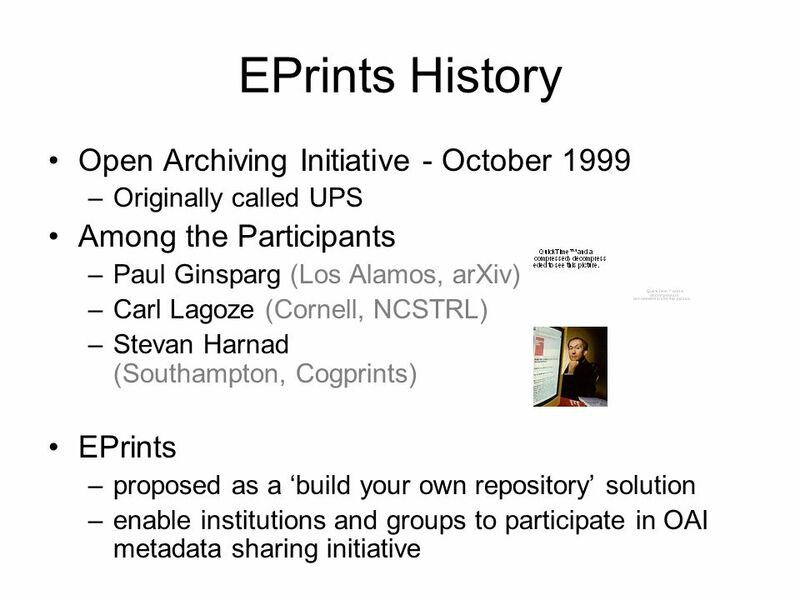 From eprint archives to open archives and OAI: the Open Citation project By The Open Citation Project team Presented by Steve Hitchcock, Southampton University. 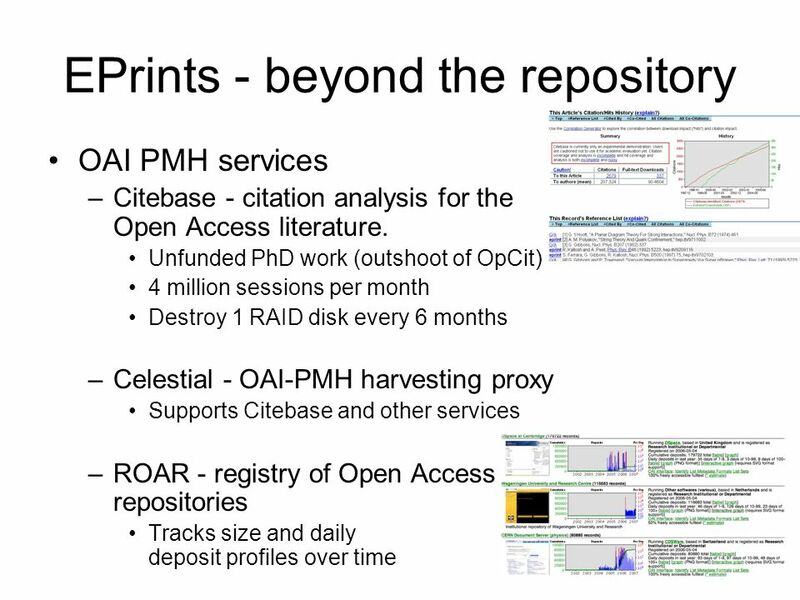 A brief overview of the Open Archives Initiative Steve Hitchcock Open Citation Project (OpCit) Southampton University Prepared for Z39.50/OAI/OpenURL plenary. Engaging repository policy with preservation Steve Hitchcock and Neil Jefferies* Preserv 2 Project School of Electronics and Computer Science (ECS), Southampton. 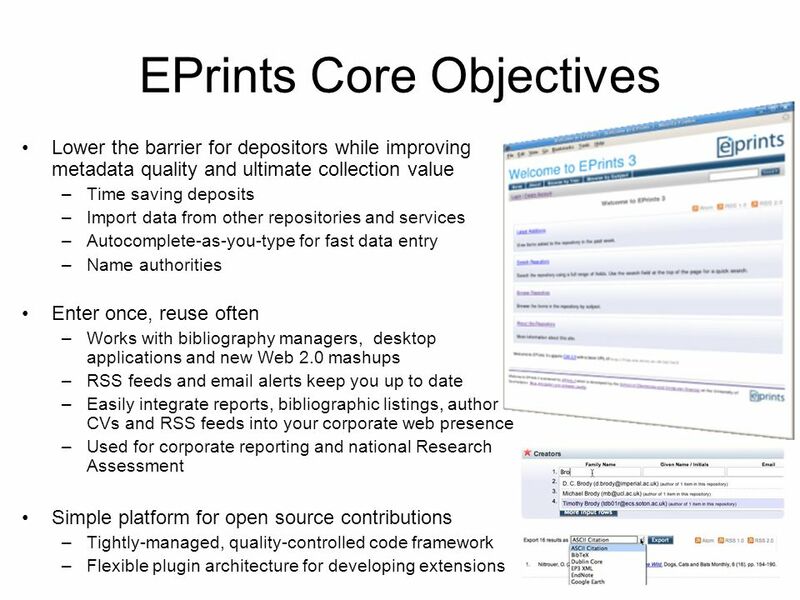 Preserv Preservation Eprint Services Scenario: Digital lifecycle begins with author creation and deposit of paper or data content into the institutional. Repository Software and Services: you have a choice (probably a wider choice than you think) Steve Hitchcock School of Electronics and Computer Science. 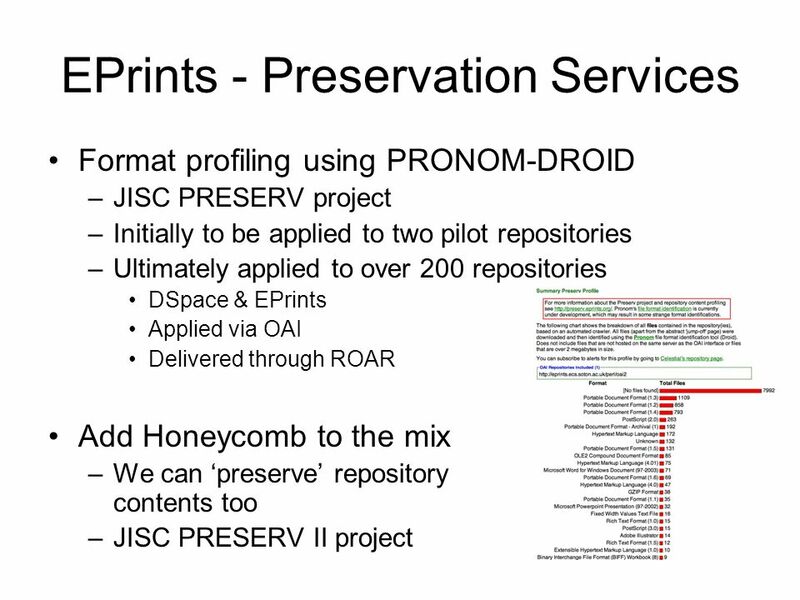 Preservation Features in Repository Software PRESERV: Tim Brody University of Southampton. 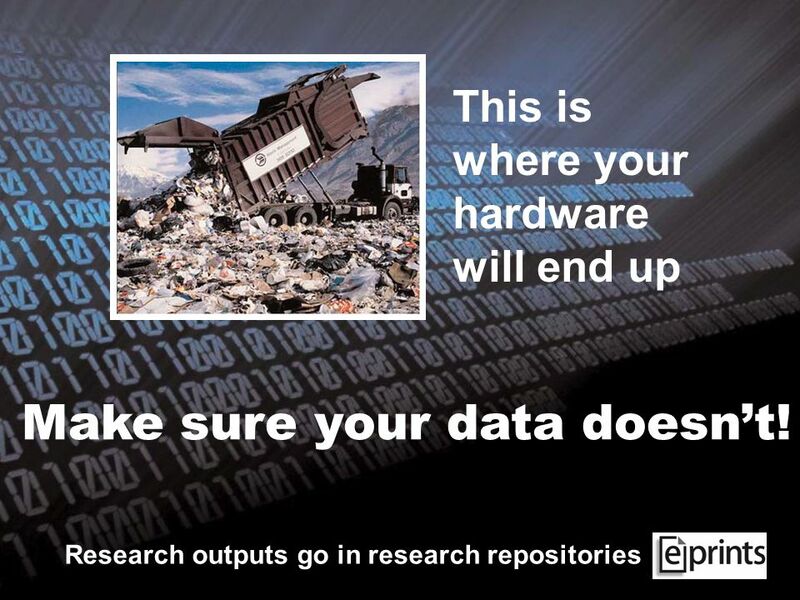 Repository preservation services: divisible, viable and sustainable? Steve Hitchcock Preserv 2 Project Intelligence Agents Multimedia Group, School of. 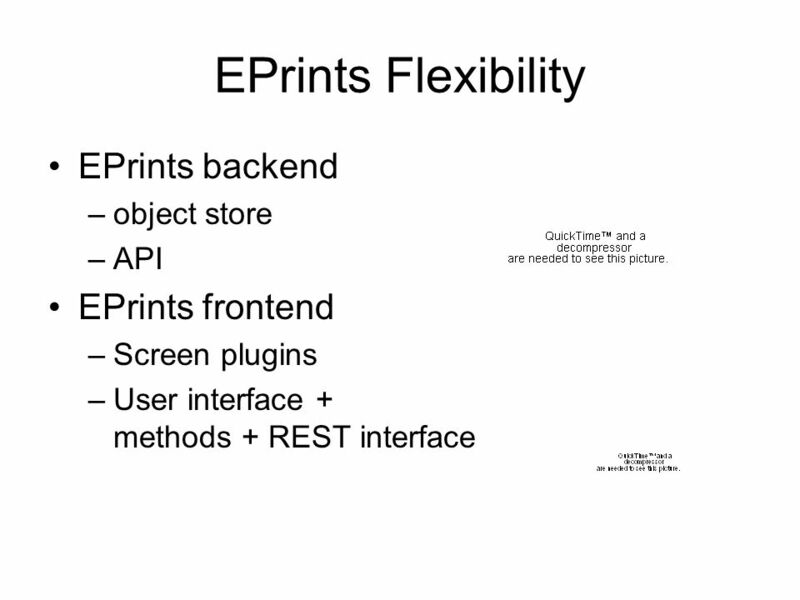 EPrints: A Biodiversity The Recent ECS publications feed on the plasma display in the foyer comes from EPrints. 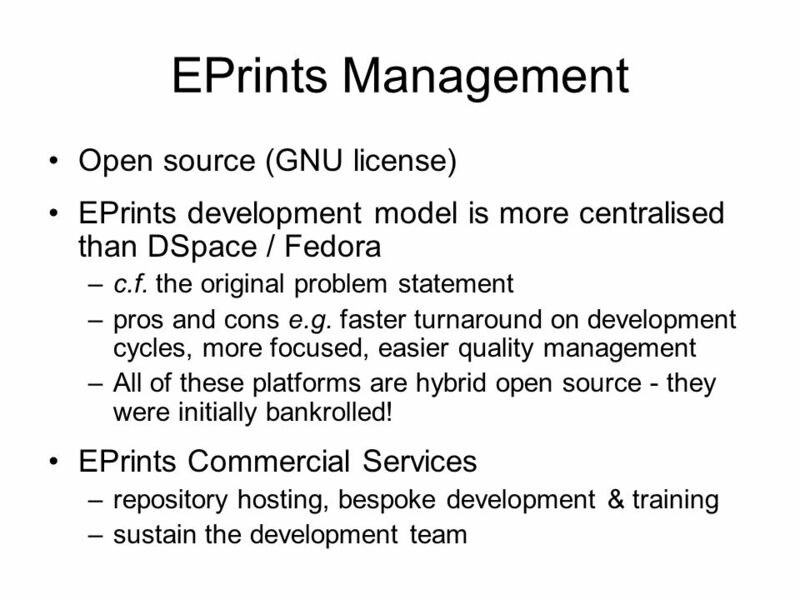 Creating an institutional e-print repository Stephen Pinfield University of Nottingham. FAIR – Focus on Access to Institutional Resources William J Nixon DAEDALUS Project, University of Glasgow e-libraries for e-learning. Business models for digital repositories OAI5, CERN, Geneva, April 2007 Alma Swan Key Perspectives Ltd, Truro, UK. Electronic publishing: issues and future trends Anne Bell.